Im kind of on the fence with this one. This a power metal "supergroup" featuring members of three of my favorite bands: In Flames, Children of Bodom and Witchery. The basic premise here is power metal with female vocals, as Kimberly Goss (of Dimmu Borgir and Cradle of Filth, I believe) is also present. Okay, fair enough, a novelty type act, but Ill give it a shot. Unfortunately, after a few seconds into the first track it sets in that most power metal singers sound like girls anyway, so basically the whole gimmick is wrecked pretty quick, and its now up to the band to actually make some good songs. The music and vocals are decent enough. Much of the music sounds like leftover In Flames or Children of Bodom riffs  good, but not nearly as compelling, and they usually make me want to go and listen to those bands instead. The vocals are good and melodic, just what you would expect from power metal, but are not nearly as unique sounding as I would have liked. 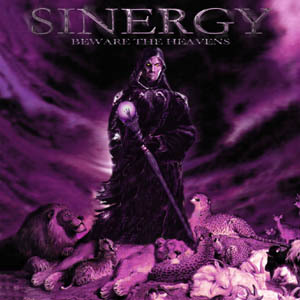 The only moments that separate Sinergy from the pack are the softer parts such as in "Razor Blade Salvation", where you can actually tell its female vocals.